Holidays rates apply the following days: New Year's Day, Martin Luther King Day, Presidents Day, Memorial Day, Independence Day, Labor Day, Veterans Day (observed), Thanksgiving and the day after Thanksgiving and Christmas Eve. All Golf ATX courses are closed Christmas Day. *Excludes Grey Rock Golf Club. Day Light Savings Time begins the first Sunday in March and ends the first Sunday in November. City of Austin residents who purchase a Golf ATX Resident card receive a discount off green fees and merchandise. Residents also receive a discount off Golf ATX memberships. To purchase a resident card you must be a City of Austin resident. Resident cards are $5.00 annually and available for purchase at Lions, Clay/Kizer or Morris Williams. 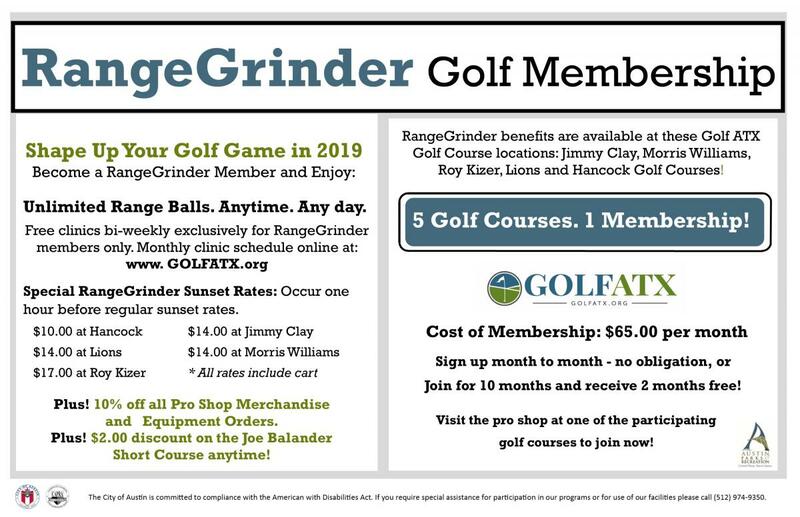 Golf ATX or Grey Rock member, Austin residents, will receive a discount on annual Golf ATX and Grey Rock member programs. Disclaimers: Card valid from January 1st through December 31st, 2019. Card not valid for any other discounted round, or program. Cards are non-transferrable. Member, Member's Spouse and any dependent, unmarried children under the age of 18. Member must be age 60 or older. Senior Member and Member's Spouse, both members must meet age requirement of 60 or older. Member and Member's Spouse, any dependent children under the age of 18. All Adult Annual Cards purchased in January, may be paid on a 60% - 40% payment plan. 60% will be paid at time of purchase and a card will be issued with an expiration date of June 30th. Upon payment of the remainder of the fee (40%) plus a $5.00 service fee, a new card will be issued for the remainder of the period. Junior Annual Cards purchased in September may be paid on a 60%-40% payment plan as well. 60% will be paid at time of purchase and a card will be issued with an expiration date of March 1st. Annual cards must be presented each time the player plays golf. A picture ID may also be required. If the player cannot present proper identification and his card, a full green fee will be charged. Grey Rock passes included with the puchase of a full fee annual card only. New private golf cart permits will not be sold by City of Austin after January 1, 2018. Current permit holders only may renew in 2019 under the "grandfather policy." Golf ATX and Grey Rock cardholders and members can enjoy a 9-hole round of golf at the Harvey Penick Golf campus for just $3.50 per round. Tee times may be booked by phoning the Harvey Penick Golf Campus at (512) 732-0380 up to 3 days in advance. Play anytime Monday thru Friday and after 12:00 pm on Saturdays,Sundays and Holidays. To receive the discount, present your membership card to the course. The Harvey Penick Golf Campus is a PGA TOUR-designed 112-acre public facility that features a par 30, 9-hole course. The course is fun for beginners and challenging for accomplished players. The course is located at 5501 Ed Bluestein Blvd, Austin, TX 78723. The promotional price applies only to the Harvey Penick Golf Campus. Offer valid thru Dec. 31, 2019.